One of my favorite things about gardening is the sense of accomplishment I get when I see the growth of the plants as the buds and flowers form, and we have the chance to start harvesting. 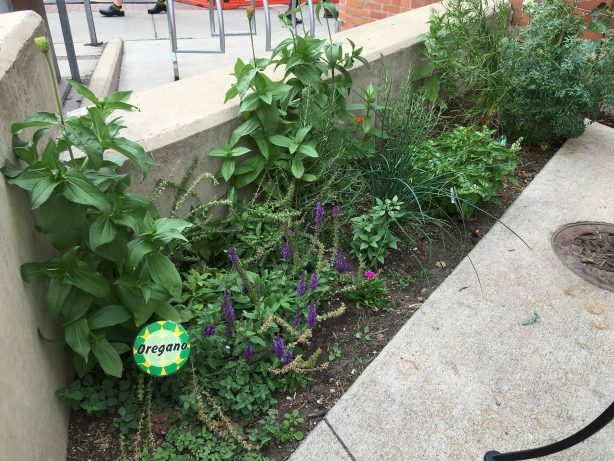 We got a bit of a late start this year with the Deli’s edible landscape, but we’ve already picked red kale to use as a garnish on some of our catering trays, we have lots of basil ready, and we’re just starting to see the jalapeno peppers and cherry tomatoes coming in. Alex and Jen have been hard at work, trimming back the old overgrown bushes (such hot work for a very hot summer! ), and planting more annuals, as well as adding trellis and supports where needed, and of course this year has included lots of watering. We’re hoping it rains sometime soon. In my last post on the subject, I shared the vision of the edible landscape and the types of things we want to plant here. I also wanted to share the story of where the things we plant are sourced from. 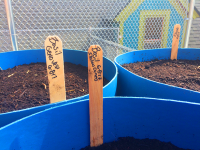 We don’t have a big budget for our landscape, so we have multiple different sources for the things we grow. 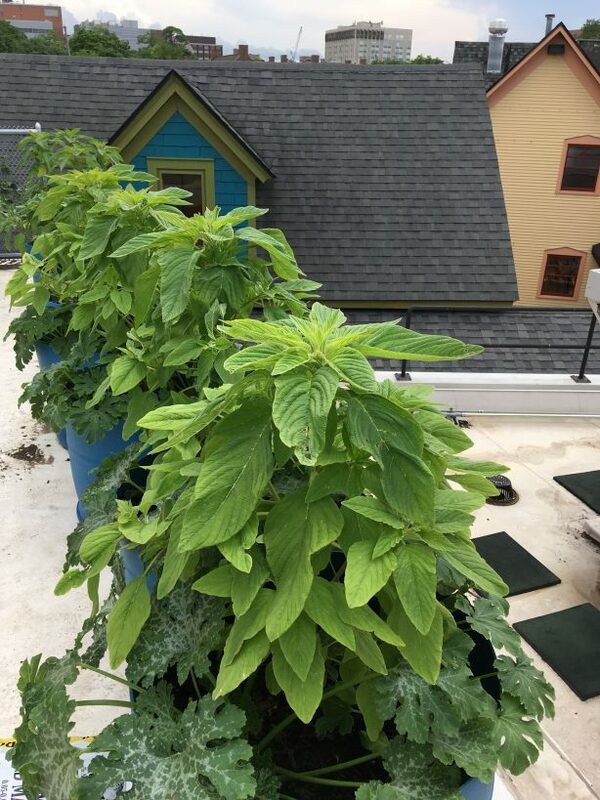 There’s a selection of flowers, herbs and lettuce that are transplanted from my home garden—I started saving lettuce seed a few years ago, and brought some of the excess seeds I had and planted them in our rooftop garden barrels. If you have ever tried saving lettuce seed, you’ll know that the lettuce flowers are very beautiful and attract lots of different bees, and once they go to seed, there is a lot of it—so it’s good to have a friend or two to share them with. I also brought in this rudbeckia variety called golden glow, it’s one of my favorites as it stands up to 6’ high and has beautiful yellow flowers. You’ll find it tucked in behind the kids area, and to the right of the next door if you’re looking at the front of the Next Door cafe. We’re lucky to have two different local seed companies in town Ann Arbor seed company and Nature & Nurture Seed Company. They help provide seeds that are best suited to our climate as well as provide a diversity of seed varieties for us to plant. Ann Arbor Seed Company is committed to open-pollinated vegetable and ornamental seeds that are all cultivated in Washtenaw county. Nature & Nurture Seeds sells only seed that are heirloom varieties, non GMO, and organic or sustainably grown, and they provide seed for many heirloom and Slow Food Ark of Taste varieties. There’s been a steady decline in the number of independent seed companies in the US over the last 30+ years (see image below), (here’s an article from the National Sustainable Agriculture Coalition) and with that decline comes a lack of biodiversity, and a homogenization of what is being grown, which leads to a lack of flavor diversity also. Flavor is the driving force behind all of our food decisions at Zingerman’s, and our desire to find the best tasting food also goes hand in hand with finding foods that are from less well known and usually more difficult to grow varieties. Local independent seed companies help support the planting of diverse varieties and increase the flavor diversity available to growers. When we want to plant starts, rather than using seed, I most often buy my starts from Frog Holler Farm located in Irish Hills MI. They come to the Saturday and Wednesday Ann Arbor Farmers’ Market, so it’s easy to walk over and buy from them, and they also have an incredible variety of plant starts including many heirloom varieties. I use them a lot for my home garden as well, as they have many unique varieties of plants that are hard to find elsewhere, and I find that their starts seem to do better than the ones I’ve purchased elsewhere. 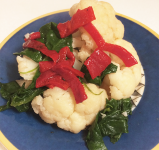 They are my go-to for padron peppers, sweet Italian peppers, and multiple different varieties of Heirloom tomatoes. 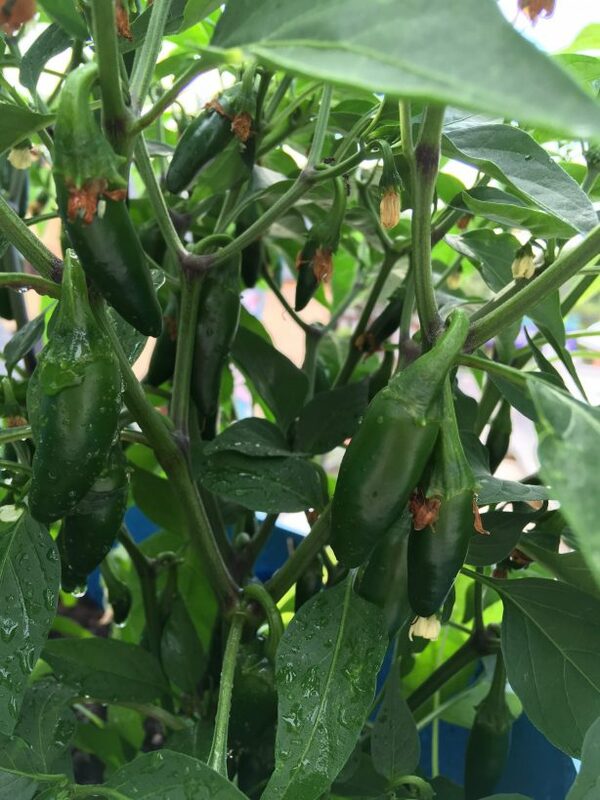 Speaking of peppers, we planted quite a lot of jalapeno peppers up in our rooftop olive oil barrel test garden. 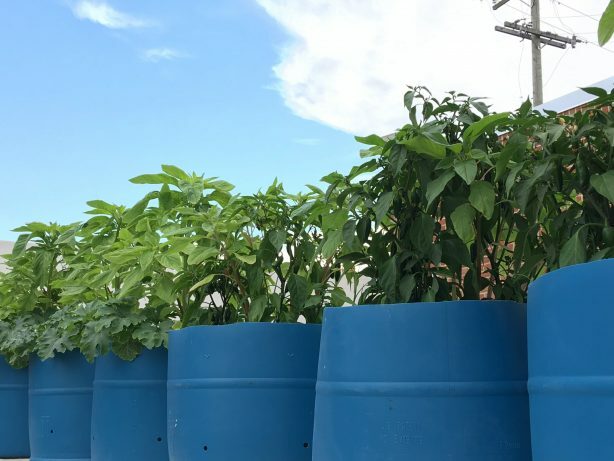 The plants are doing well, and our new design for the olive oil barrel reuse seems to be working better than what we tried last year. 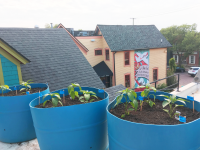 We’re excited to see all the small peppers on the plants—they are loving this hot summer and they get lots of sun up on the roof. If all goes as planned we’ll be able to harvest the peppers when the first ripe peaches show up at the market (usually late July/early August) so we can pair them together in our salad case. 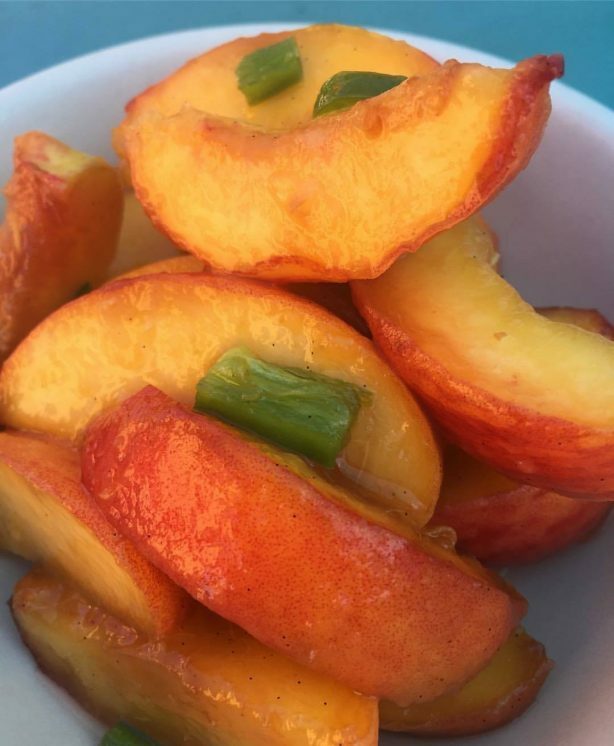 It’s one of our most popular seasonal items, Jalapeno Peaches. You can check out our our “What’s in the Salad Case” page that’s updated daily to see when they’re available!